Combine a family vacation with a host of active learning opportunities. In Gulf Shores and Orange Beach, design your days to explore nature, history, naval, scientific or cultural activities to spark your children’s sense of wonder, discovery, and enlightenment. The remainder of the email outlined an itinerary complete with links to points of interest, cultural activities, and historic sites in the area. After reading through the email one of my first thoughts was that this was great for homeschoolers who live in the area, but what about everyone else? Then I realized that if nothing else this would make a great template that anyone could use to customize a learning vacation for their own area. Simply change “Coast” to “Mountains”, Prairies”, “Plains” and so on. “Water” could be “Lakes”, “Glaciers”, “Deserts” and of course “Wildlife and “History” can be found everywhere. Next, research and add your own links to points of interest, cultural activities, and historic sites in your own area. So please feel free to develop your very own learning vacation using the following as a template and please share it in the comments below. Alabama’s beautiful beaches are the perfect place for a lesson on tides, sea life and dune conservation. Take a family fishing trip to learn how our waters, sea life and eco-system are protected with sustainable fishing practices. Climb on board a dolphin cruise, or take part in a shrimp or oyster excursion. Explore Alabama’s Coastal Connection, an award-winning National Scenic Byway. Take a ferry ride to Dauphin Island Sea Lab for an introduction to the Mobile Estuary system. Observe rare plant and animal species, and wetlands restoration at Graham Creek Nature Preserve. Explore the Mobile-Tensaw Delta, America’s second largest river delta and home to more than 300 species of birds, 126 species of fish, and 500 species of plants. Trace the path of Admiral David Farragut to capture Fort Morgan and Fort Gaines during the Battle of Mobile Bay. Visit the Foley Alabama Railroad Museum and model train exhibit and glimpse into a time when railroads played a major role in our country’s prosperity. Admit yourself at the Homes Medical Museum, located in Baldwin County’s first hospital. Check out local artifacts and Native American memorabilia, and learn about our area’s fishing heritage at the Orange Beach Indian and Sea Museum. Tour historic Bellingrath Gardens and Home in nearby Theodore, or the Swift-Coles Historic Home in Bon Secour. Immerse yourself in the sights and sounds of aviation history at the world’s largest naval aviation museum, the National Naval Aviation Museum, home of the Navy’s elite flight demonstration squad, the Blue Angels. Walk the decks of the mighty battleship USS Alabama, a national historic landmark, and go below on the USS Drum, a WWII submarine. 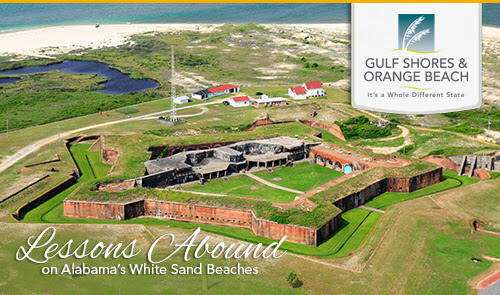 Come explore Alabama’s beautiful beaches, and leave with newfound knowledge and family memories to last a lifetime. Order a vacation guide and start planning today.